Happy Memorial Day Weekend! Let the (unofficial) kickoff to summer begin! Does everyone have fun plans? I'm spending the weekend in Burlington, Vermont with the whole family. We have some family members running in the Vermont City Marathon, so we're headed there to cheer them on! I'm excited for a weekend filled with family, BBQs, and roaming around Burlington. However, I'll be making sure to take a little time for online shopping, because there are a lot great sales going on! I rounded up my favorite stores having sales, along with the items that I have my eye on. I already bought this top in white, and this top is next on my list. I'm thinking it will be perfect for those cooler nights by the lake. Now lets talk about this dress. If you don't own it, I'm serious when I say you should! Not only is the cotton material comfortable and a perfect for a hot summer day, but this dress is super flattering. I've seen it look good on so many different body shapes, and I love how the ruching hits in the right spot, concealing the leftover twin pouch (okay, I can't blame them anymore, I need to blame the Hershey Kisses I eat daily). 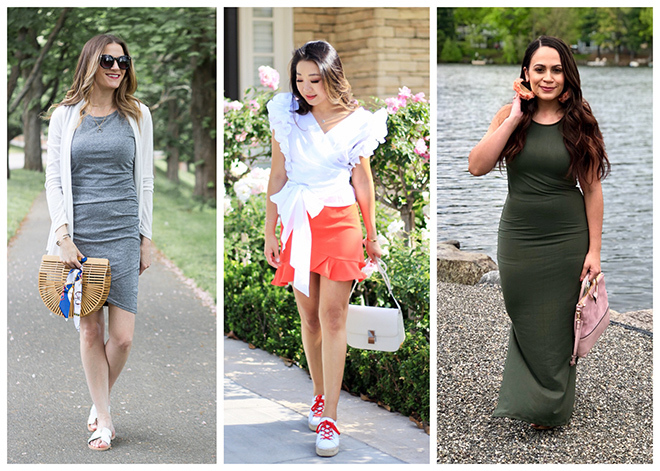 I also love that I can throw it on with sneakers or sandals for a cute daytime look, or dress it up with heels and a pair of statement earrings. Although this dress is not on sale, it is under $60 and comes in nine colors. (It does come in a denim and coral color, which is on sale, but I believe there is only size XL available). You can bet I'll be adding another color to my wardrobe real soon, I'm thinking the black is a must! Anthropologie: 40% off sale home + 25%% off sale clothing, accessories and beauty. J. Crew: 40% off your purchase, including new arrivals! Old Navy: 20% off your order, 50% off tees, tanks, shorts, and swim and 30% off dresses! The feature blogger is Nicole from What Nicole Wore. 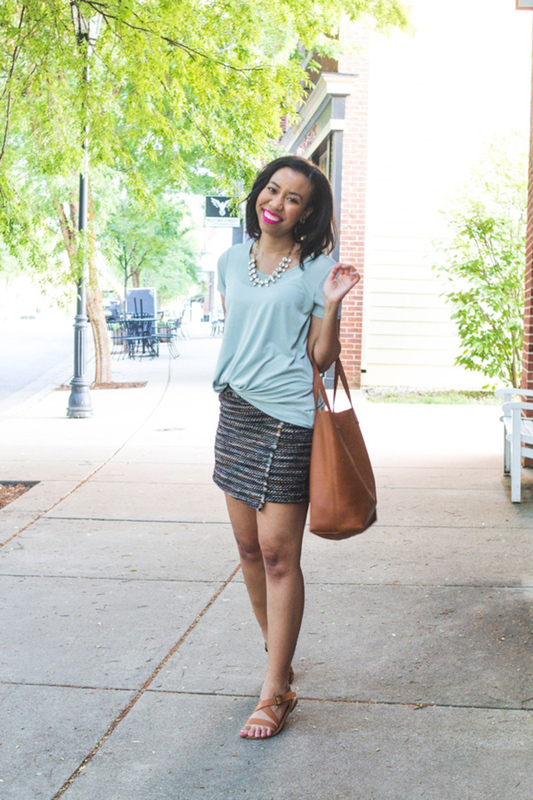 Not only am I loving her outfit and bold lip color, but I love the message behind her blog post. Make sure to stop by her blog to check it out, and say hello! A perfect dress foe summers. Lovely you looking! This is a great dress that you can combine with many different type of accessories! Happy Memorial week-end! Spending time with family too! This dress is super flattering and I love that it versatile! Wishing you a marvelous weekend! that dress truly is a classic and you look amazing in it. You really can't go wrong with neutrals like this grey dress. Such a versatile piece. This dress fits you like a glove! It's perfect for this weekend too. Happy holiday weekend!! I have this dress too and love it. In fact I'm going to wear it tonight. I've styled it for work and evening on the blog as well. I hope you have a fantastic weekend! Rachael, you are rocking this dress! I love the soft heathered gray color which it makes it so versatile. And you have styled it perfectly! Have a fabulous holiday weekend, my friend. I love easy dresses like that! You look great! That's a great dress! I love the ruching! Looking fabulous! I just added this dress to my bag at Nordstrom—I can't believe it has 1,800 positive reviews! I've seen it on other bloggers too, and it really does look great on everybody! Sold! Amazing look...I love this dress! Have a wonderful holiday weekend! It is a fabulous dress! Have a great weekend. Such a cute dress! I love the neutral color, it'll be so fun to accessorize! I just got a similar bag to yours and I love the little tie you added to it! I need to do that! Looove this dress- actually just scored it in the coral-blush version and it's sooo good! I do think everyone needs that dress! Looks so flattering, I can see this dress style super casual with sneakers. I hope you had a wonderful weekend!! This is such a great neutral dress. I love the way it drapes and how flattering it is! Totally agree with you! I have the longsleeved version of that dress and love it. I need the sleeveless version too! It's so versatile and easy to wear! Yours looks amazing on you! I love the casual way you styled this dress. It looks effortless!